What happened, I think, is some Bucs coach was drinking coffee at halftime, strong coffee, given the first half, when he spilled it on the team roster, and he wiped it off and saw that there was a 27 on their side, Blount, kid named Blount. Oh, yeah. OK, maybe that wasn't how it worked, exactly, but what followed mattered greatly, to be blunt, or Blount. For six quarters, LeGarrette Blount, former 1,000-yard rookie sensation, was utterly silent and a little lost. He had five carries for 15 yards in the opening loss to the Lions, watching most of the second half. He had five carries against the Minnesota Vikings in the first half Sunday - for four yards. He was going backward. His team was down 17-0. It was 0-1 and heading for 0-2, abyss enough. Then a funny thing happened. The Bucs went back to Blount. Raheem Morris and his coaches didn't panic this time and go to the hurry-up offense that left Blount on the sideline against Detroit. They stuck to the plan, and the plan was 27, until the end, when Blount powered in from four yards out with 31 seconds left for the winning touchdown in a 24-20 rouser. Well, what do you know, he can run! On the Bucs' second offensive snap of the second half, the opening act to a rousing 24-20 comeback win, Blount ran through a gaping hole and went 27 yards for the Bucs' first score. His team rallied to him. There was a spark. "We felt the energy on the sideline after that," Bucs offensive coordinator Greg Olson said. The next time Blount was handed the ball, he went left for 13 yards, and when he came to one Vikings defender, he - all together now - jumped over him. Remember tyhat? "That hurdling, it looked familiar," Bucs right tackle Jeremy Trueblood said. Everything after that did, too. "That first touchdown, that one play, started it," Bucs right guard Davin Joseph said. "When we've got him running over, jumping over, whatever he does, it enthuses our offense," Bucs cornerback Ronde Barber said. 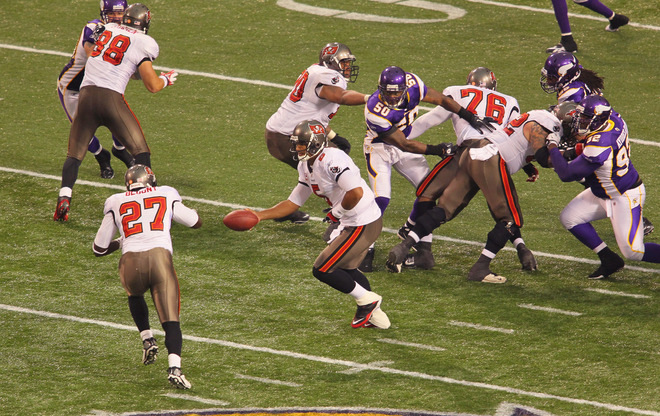 "We came out and got LeGarrette rolling …" Josh Freeman said, who didn't roll so bad himself after halftime. Freman mentioned other second-half stars, and there were many, but he came back to this: And LeGarrette got going." Here was Blount early last week, after Detroit, quietly, measured, but with a point to make. "I feel like I'm a playmaker on this team also," he said. Point made. It went beyond those 67 second-half yards and scores. Blount was a one-man momentum machine, and he insisted he did not run angry or out of frustration or a need to prove a thing to his coaches. "I wasn't angry, I wasn't frustrated. I just wanted to get something going," Blount said. "I don't get frustrated. Last year, I didn't play until the third game." 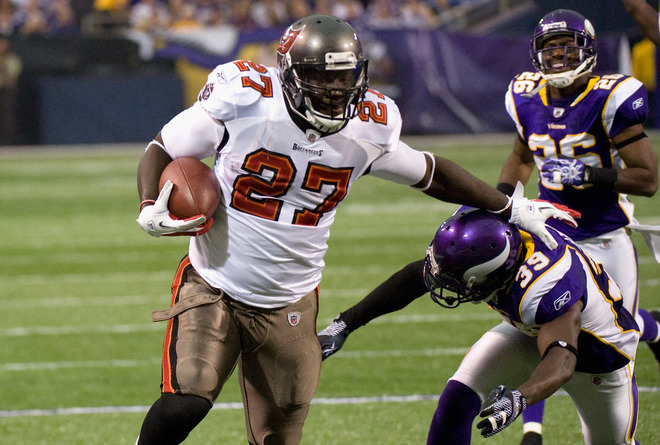 Still, some of us were starting to wonder if the Bucs staff remembered that Blount was in fact the featured back, or realized that if they couldn't run against Minnesota's defensive line, well, the Bucs had serious issues. So they went to Blount. Well, what do you know, it worked! This is the way the Bucs will have to win this season, with Blount out front, with play-action and Freeman feeding off it, and with a young defense making its share of stands. Blount rightly shared the wealth. He hailed his offensive line, with reason. On his 27-yard score, the line moved it out, Joseph on the front-side linebacker, Trueblood and tight end Luke Stocker on the middle linebacker, center Jeff Faine sealing off the nose tackle. "They made a lot more than a nice little hole," Blount said. On the winning run, it was Bucs left guard Jeremy Zuttah pulling and Blount following. And LeGarrette got going. "They called my number and we got it," Blount said. "It was your basic power play, man against man."